CoilyQueens™ : Do white clumps and specks constantly ruin your twist out? Do white clumps and specks constantly ruin your twist out? 1. Reduce the amount of product you use. Most naturals are to heavy handed with their style products. More product does not necessarily mean better style results. If white product build up is your issue, reduce the amount of product you use by half. As you pour product, make it a habit of putting half of the amount back in the bottle. This will help you so break the habit of overusing products. 2. Test product compatibility before doing your whole head. You should always use a leave in conditioner under your gel or style product. Unfortunately this is where it can go wrong. 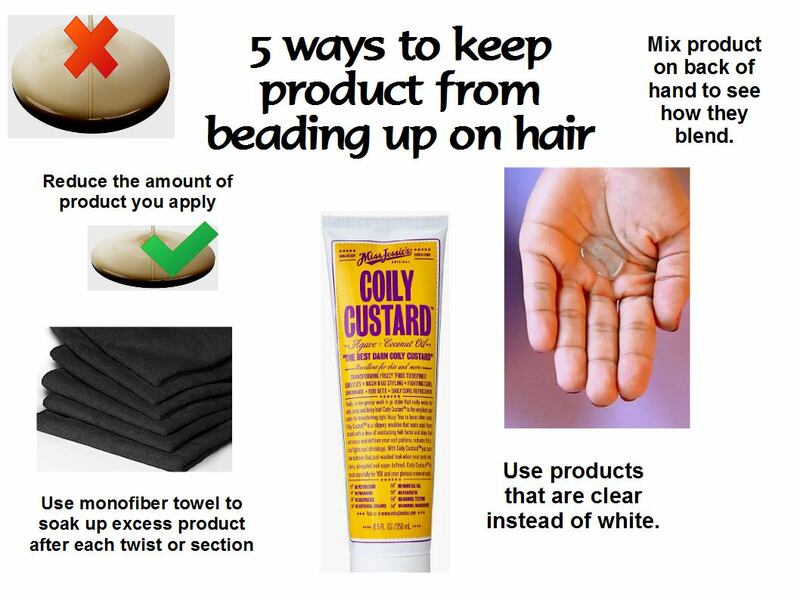 Before you waste time and product, test the compatibility of your products, before doing your whole head. Put a nickel size amount of each product on the back of your hand. Blend the products together. Examine closely how well the two products mix together. Do you see separation? Do you see clumps? Let it settle for 60 seconds. The two products should blend to a clump free smooth consistency. If it does not then do not apply that product combination to your hair. 3. Stay away from products that are white opaque. Buy products that are shear in color. This is a good way to not have white specks form on your hair. Miss Jessie's curling custard is clear color. It also creates great wash and goes and twist outs.This can be a challenge, because most leave ins are white opaque. Consider using a liquid leave in spray, if this is a constant issue for you. 4. Dab away excess product when done setting your style. A good indication of overusing product, is when you can see excess product oozing out your twists, once you have finished twisting. Instead of leaving that excess product sitting on top of you hair, lightly wipe it away with a mono fiber towel. Or tie down with a scarf so the scarf soaks up some of the product. Tying your hair down with a silk scarf, will also soak up excess product. 5. Stay away from cheap products. Cheap ingredients are mostly likely to bead up on your hair. You get what you pay for. Cheap products do not mix well with other products. Invest in all natural products. Purchase your gel and leave in conditioner from the same line. Products from the same line are compatible with each other, in most cases.